Scientists and policymakers from the US and Brazil met in Ãguas de LindÃ³ia, Brazil May 30-31 for a biofuels symposium “to create sustainable research collaborations for improving biomass conversion into fuels and value-added chemicals and materials.” This comes after the March meetings between Brazilian President Luiz InÃ¡cio Lula da Silva and U.S. President George W. Bush, which established a collaborative relationship between both countries’ burgeoning biofuels industries. Chemical and Engineering News Senior Editor Stephen K. Ritter and Environmental Science and Technology Associate Editor Erika D. Engelhaupt spent 10 days in Brazil during the symposium and logged their observations from the symposium and their travels in a Brazil Blog. There are several interesting entries to the blog. One in particular covers the research of LÃ­lian Lefol Nani Guarieiro, a Ph.D. student at the Universidade Federal da Bahia who’s research into unregulated emissions from biodiesel, â€œDetermination of C1-C4 Carbonyl Compounds from Car Engine Exhaust Using Biodiesel/Diesel Mixtures,â€ won a student poster competition at the symposium. Guarieiroâ€™s project examined aldehyde emissions from various biodiesel blends made from soy oil. She found that some emissions tripled when the percentage of biodiesel in a blend was 20% or greater. Acrolein and acetaldehyde emission levels increased significantly, and formaldehyde also showed this pattern. Propanol and butanol had smaller increases. The results point to an important issue, Guarieiro says, because these emissions could adversely affect air quality. The volatile organic compounds can contribute to smog formation, and formaldehyde and acrolein are mutagenic. Don’t miss the blog entry on making delicious Caipirinha (the Brazilian mojito, if you will) made with cachaÃ§a, a sugar cane brandy. decouple economic growth from the consumption of fossil fuels. Decentralized energy systems, where power and heat are produced close to the point of final use, avoid the current waste of energy during conversion and distribution. They will be central to the energy [r]evolution – as will the need to provide electricity to the two billion people around the world to whom access is presently denied. The time is right, within the next decade, to make substantial structural changes in the energy and power sector. Many power plants in industrialized countries, such as the USA, Japan and the European Union, are nearing retirement; more than half of all operating power plants are over 20 years old. At the same time developing countries, such as China, India and Brazil, are looking to satisfy the growing energy demand created by their expanding economies. Within the next ten years, the power sector will decide how this new demand will be met, either by fossil and nuclear fuels or by the efficient use of renewable energy. The energy [r]evolution scenario is based on a new political framework in favour of renewable energy and cogeneration combined with energy efficiency. To make this happen, both renewable energy and cogeneration – on a large scale and through decentralized, smaller units – have to grow faster than overall global energy demand. Both approaches must replace old generation and deliver the additional energy required in the developing world. As stated, the climate change imperative demands nothing short of an energy revolution. At the core of this revolution will be a change in the way that energy is produced, distributed and consumed. High in the Himalayas, the isolated mountain kingdom of Bhutan has done more to protect its environment than almost any other country. Forests cover nearly three quarters of its land, and help to absorb the greenhouse gases others emit. Its strict conservation policies help to guard one of the world’s top 10 biodiversity hotspots, often to the chagrin of its own farmers. Yet Bhutan could pay a high price for the sins of others — global warming is a major threat to its fragile ecosystem and the livelihoods of its people. “Not only human lives and livelihoods are at risk, but the very backbone of the nation’s economy is at the mercy of climate change hazards,” it wrote in a recent report. Arctic Ocean sea ice is melting faster than even the most advanced climate change models predict, a new study concludes. The work, published today in the journal Geophysical Research Letters, used the models to retroactively predict sea-ice decline from 1953 to 2006. Scientists then compared the results to what has actually been recorded by Earth-based and satellite observations during that time frame. The team found that, on average, 18 climate models used in a 2007 report by the Intergovernmental Panel on Climate Change (IPCC) underestimated the extent of sea-ice decline by a factor of three. “We’re about 30 years ahead of what the models show,” said Julienne Stroeve, lead author of the study and a researcher at the National Snow and Ice Data Center at the University of Colorado in Boulder. Are they useful or just the 21st century equivalent of indulgences? But is the carbon-neutral movement just a gimmick? On this, environmentalists arenâ€™t neutral, and they donâ€™t agree. Some believe it helps build support, but others argue that these purchases donâ€™t accomplish anything meaningful â€” other than giving someone a slightly better feeling (or greener reputation) after buying a 6,000-square-foot house or passing the million-mile mark in a frequent-flier program. In fact, to many environmentalists, the carbon-neutral campaign is a sign of the times â€” easy on the sacrifice and big on the consumerism. As long as the use of fossil fuels keeps climbing â€” which is happening relentlessly around the world â€” the emission of greenhouse gases will keep rising. The average American, by several estimates, generates more than 20 tons of carbon dioxide or related gases a year; the average resident of the planet about 4.5 tons. At this rate, environmentalists say, buying someone elseâ€™s squelched emissions is all but insignificant. Global Warming: Who Losesâ€”and Who Wins? …an articifical greenhouse effect could harm nations that are already hard pressed and benefit nations that are already affluent.Â If Alaska turned temperate, it would drive conservationists to distrcation, but it would also open for development an area more than twice the size of Texas.Â Rising world temperatures might throw Indonesia, Mexico, Nigeria, and other low-latitude nations into generations of misery, while causing Canada, Greenland, and Scandinavia to experience a rip-roarin’ economic boom.Â Many Greenlanders are already cheering the retreat of glaciers, since this melting stands to make their vast island far more valuable. Historically priveleged northern societies might not decline geopolitically, as many commentators have predicted.Â Indeed, the great age of northern power may lie ahead, if Earth’s very climate is on the verge of conferring boons to that part of the world…By the middle of the 21st century, a new global balance of power may emerge in which Russia and America are once again the world’s paired superpowers – only this time during a Warming War instead of a Cold War. Shifts in the relative values of places and resources have often led to war, and it is all too imaginable that climate change will cause nations to envy each other’s territory…Suppose climate change made Brazil less habitable, while bringing an agreeable climate to the vast and fertile Argentinean pampas to Brazil’s south.Â Sao Paulo is already one of the world’s largest cities.Â Would a desperate, overheated Brazil of the year 2037 – its population exploding – hesitate to attack Argentina for cool, inviting land? …What if the climate warms, rendering much of Pakistan unbearable to its citizens?Â (Temperatures of 100-plus degrees are already common in the Punjab)Â Afghanistan’s high plateaus, dry and rocky as they are, might start looking pleasingly temperate as Pakistan warms, and the Afghans might see yet another army headed their way. 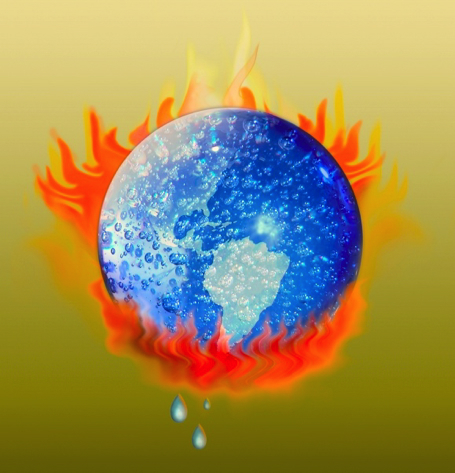 Most prominently, the renowned British scientist James Lovelock thinks that the world is already approaching a tipping point, beyond which temperature rise will run out of control and major ecosystems will collapse. The dying Amazon rainforest would begin releasing carbon, making things even hotter. The permafrost would melt, releasing carbon and causing sea levels to rise. To avoid hitting the “critical threshold,” he says, the worldâ€™s total carbon emissions must be reduced to 60 percent below current levels by 2030â€”a target that would require the developed world to reduce emissions by 90 percent (to compensate for growth in China, India and other developing countries). Monbiotâ€™s plan: each nation would be allocated a carbon limit based on urban population and each individual an annual carbon allowance. Governments, meanwhile, would redesign transport systems, generate renewable electricity, build energy-saving homes and offices, and update the old ones. Appliances would be “smart” enough to know when to turn themselves off. And his most radical idea: airline travel would have to be scrapped.